THREE GENERATIONS Charles Imwalle, Kevin Imwalle Hatch and Joe Imwalle III (L–R) at Imwalle Gardens. As far as business plans go, Joe Imwalle's is pretty simple. He doesn't advertise. He has no cell phone, doesn't use a computer and isn't sure what email is all about. His wife, Maria, keeps the books, and son Charles, who will eventually take over, works alongside him. His employees are few and loyal: most have worked there for two decades. Thanks in part to paying no rent, he can afford to keep his prices low. As he puts it, "I just can't gouge people." 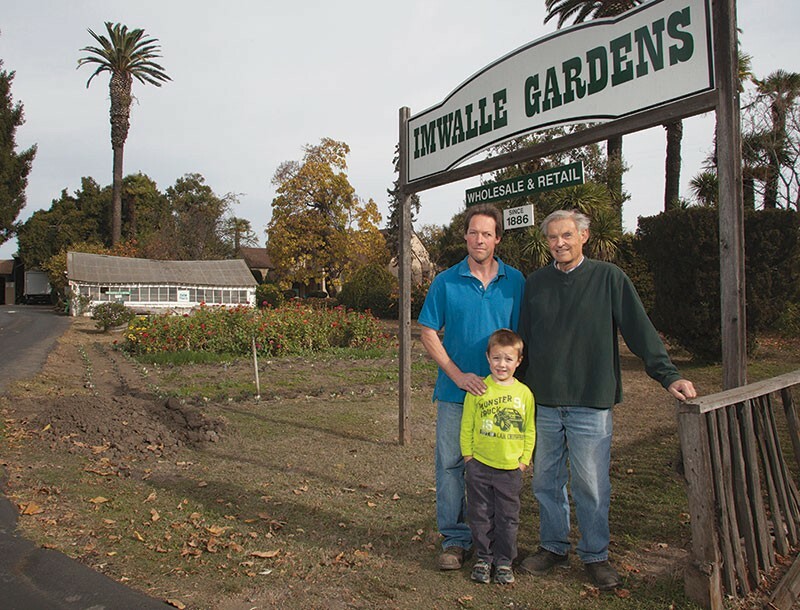 Unsurprisingly, the family-owned Imwalle Gardens, which has been growing and selling produce and plants since 1886, is the business most locals said they would hate to see closed, according to a recent local poll. Lucky for them, Joe shows no signs of stopping. "I'm 73; I should be retired," he tells me on a recent afternoon. We're sitting in his office, a cozy nook just off the barn, which his grandfather built out of virgin redwood in 1919. His desk is filled with photos of his three grandkids, a clutter of papers and order forms, and a phone that periodically chirrups. He grins and explains, "Business has really grown the last few years. I've built it up so big that I can't leave it now!" This despite the fact that the very popular Oliver's Market, with its polished produce, opened a nearby store on Stony Point Road in 2007. "We don't aim to sell everything under the sun," says Imwalle of the difference between his stock and that of a supermarket, "and we can't give you a box of perfect-looking tomatoes." What they do have, though, is remarkable: a huge selection of flavorful produce, much of it grown right on their eight-acre farm, sold at surprisingly low prices. On a recent visit, I picked out a bunch of organic kale, a shallow basket of plump blackberries, two local Rome apples, an organic onion and two huge gold beets. My total came to $5.79. I had to check the receipt to believe it. Longtime customer Hannah Bartee remembers pulling into the parking lot one summer day. "There was Joe," she smiles, "plucking figs off the giant fig tree, then bringing them right into the store to sell." The store itself is little more than a covered stand, where the wagons used to load up their vegetables for delivery. In addition to all the produce, Imwalle sells a smattering of bulk nuts, dried fruits, crackers, cider and some other picnic-worthy items. And then there's the nursery, a maze of greenhouses filled with bedding plants and vegetable starts, potted ferns and coleus and tuberous rooted begonias, which were developed by Imwalle's grandfather, Joseph. When he moved to the United States from Germany in 1885 at the age of 21, Joseph was already a skilled horticulturalist. For years, he saved up to buy 15 acres on West Third Street in Santa Rosa, which at its heyday blossomed to a population of 60. But from a business standpoint, flowers weren't enough—"You can't make a living just selling shrubs," Imwalle points out—so Joseph started growing vegetables for his burgeoning truck-garden business. "He used to deliver by horse and buggy," says Imwalle, who was eight when his grandfather died. "The horses knew the way to the customers' houses and knew how to get back home again." According to his granddaughters, Joseph was a talented, classy man: he did his hoeing in a suit and tie, often collaborated with friend Luther Burbank and won a gold medal at the San Francisco World's Fair in 1915. The farm's business survived the inevitable grind of development, especially the opening of the Golden Gate Bridge in 1937, which gave people access to San Francisco's farmers markets stocked with Central Valley produce. Joseph's two sons, Joseph II and Henry, took over the business when he retired in the 1940s, expanding the acreage with a hop yard and prune orchard. Once again, the business survived another disruption in the form of Highway 12, which bisected the property and cut half the land off from the creek's water supply. Eventually Joe III, who'd been learning the farming business since his first steps, graduated from Santa Rosa Junior College and joined the Marine Corp Reserve. Had he done better in English, he would've liked to become a teacher, like his mother and sisters. Fate had it otherwise: in 1966, when Imwalle was 23 years old and in the Marine Corp Reserve, his father died, bequeathing his half of the business to his only son. When his uncle retired, Imwalle bought him out, split the land and continued farming. Imwalle tends to speak not in dates but in time passed. He remembers when Santa Rosa was a nice little friendly town of 17,000 people who moved about with relative ease. Forty-five years ago, he marvels, you could buy a beautiful home with hardwood floors, a fireplace and a two-car garage for $14,000. Twenty-five years ago, he'd wake up at midnight twice a week and trek to San Francisco to buy and trade produce. One hundred and twenty-seven years after its founding, the family truck-garden business lives on, keeping many local restaurants, from La Gare to the Union Hotel, in supply of wholesale produce. The fourth generation of Imwalles are all actively involved—in addition to Charles, Imwalle's sons Paul and Joe IV work there part-time, and his daughter Angela, who also lives on the property with her family, helps out a lot. Thanks to his recent business boom, "the work days are longer now than they were 10 years ago," says Imwalle, who, along with Charles, works from 7:30am until 6:30pm most days of the week. In the evening, he sits at his kitchen table, typically taking about two dozen produce orders by phone while watching the shows he likes best—Dancing with the Stars, college football, Family Feud. "Charles works just as hard as I do," he tells me more than once. Much has been made about the value of Imwalle's property, smack in the middle of the city, a developer's dream. Several years ago, at the height of the market, Imwalle's two sisters sold off their 10-acre share. But when I ask him about the worth of his share, he is characteristically nonchalant. "Four or five years ago, it was worth a lot," he admits. "But now the value is much less." Imwalle shrugs and continues, "Money isn't everything. Health is more important, and the joy you get from work. I've lived here my whole life," he tells me, "and I'm gonna die here." The phone rings and a customer pops his head in, asking about the best price for onions for this weekend's polenta dinner. Imwalle will get him 20 pounds by Friday morning. When I tell him nearly 45 minutes have passed, he's surprised. It's time to get back to work.